We would like to invite you for tea, coffee, treats and a special project on Valentines Day! You can make a cute heart pincushion here in a couple of hours. The kit for the pincushion is $8.25 and we will provide thread and a bit of stuffing. You can also purchase ground walnut shells if you prefer. Also, for a bit of extra love, pick out a Valentine at the counter to see what discount you can have off of your sale. 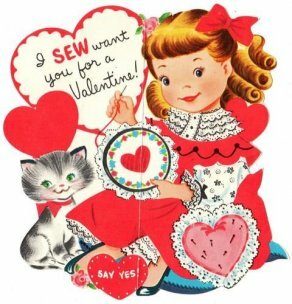 Our Valentines will have anywhere from 15% - 30% of that is good on regular priced fabric, books, notions, and patterns! 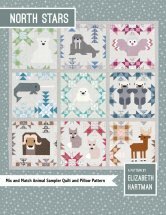 Elizabeth Hartman designs such delightful patterns and North Stars is no exception! Each block is 24" square. There are 9 adorable North American animals that create an 82" x 82" quilt. The cost each month is $25 which includes the book, sashing and binding. 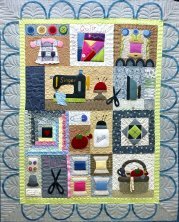 Terry Vick made this sweet quilt using wool applique on cotton backgrounds. The finished quilt comes to 51" x 63". There are 4 rows that make up the kit and is $40 for each row. The price includes the pattern and borders (binding not included). You can call the store to sign up for any of our block of the months. We will keep your credit card on file and charge and mail your block at the 1st of each month. You can see our other BOMs that are still available on our web site! We still have many bolts of fabric that are on clearance however many are gone! You don't want to miss out. All the bolts of fabric with foil stars on them are now 40% off (one yard minimum)! Finish a bolt and get 50% off! Foundation Piecing with Toni (2/12, 16, 26)- The 2nd and last Tuesday, and the 3rd Saturday of each month. Toni is on hand to teach you her foundation pieced method and you can pick any of the projects that she has developed. It doesn't matter if you are in the middle of one of her projects or want to begin something new. It is always more fun to sew with friends! The Gentle Art of Hand Stitching (2/21)- We meet on the 3rd Thursday of each month to work on hand projects. It is a great time to share what we have been working on! Open to all skill levels and beginners are definitely welcome! Quiltmakers of the Tamaracks, our guild here in Seeley Lake, meets on the 3rd Wednesday and Thursday for 2 days of sewing. They would like invite anyone who is interested to join them. If you quilt, knit, rug hook, embroider, or any craft, you are welcome to join them at the Community Hall. By renting the hall for 2 days, they can leave everything set up and sew for however long they wish. Most of the time lunch is on your own. It is a good way to meet new people in our community that share a love of crafting! If you are interested you can let Kim know by contacting her at 940-367-4470 or e-mail her at ksee2@mac.com.